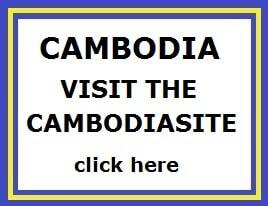 "The Vinh Moc tunnels were very impressive indeed. Tunnels on a beach head running in every direction 3 different layers, all interlinked. Wells, Nursery, Stables for cows and Pigs, living quarters and a theatre. Enough for people to live underground for many years without the need to surface. The tunnels were mainly civil defence not military, but above ground there was also trench’s and bunkers where the local defence could keep watch and protect the tunnels. We wondered about in the small tunnels which were perfect height for our guide but us European descendants had a bit of a hard time with the low ceiling". In Vinh Moc - you'll find a very impressive temple complex. They are the remains of a North Vietnamese fishing village, where the people have built a tunnel complex to protect themselves against the American bombing. Literally, the village went underground. It offered protection to more than 90 families. The tunnel complex has three levels. The majority of the tunnels is open to visitors and is kept in their original state (with the exception of the recent addition of electric lighting). During the war in Vietnam between 1968 and 1975 Vinh Moc was located in what the US had designated as "free fire zone". Here was everything that moved a legitimate target. Constant bombardment by B-52 aircrafts made life above the ground impossible. So while some residents fled, others dug in. So the whole village of Vinh Moc moved underground. 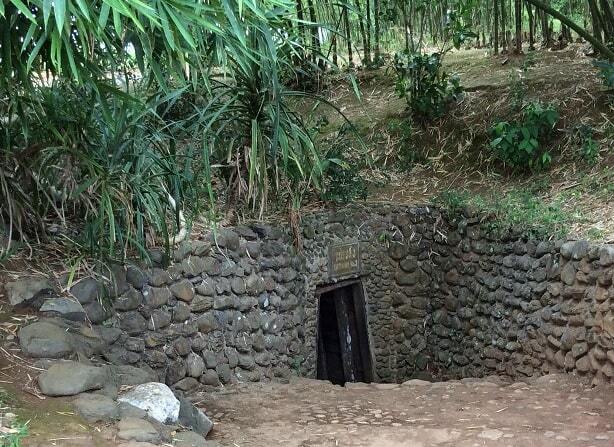 Using only primitive tools, they dug out a large network of approximately 3 km underground passageways. The heavy clay earth made it possible to dig deep. The residents went only out to work at their rice fields in the evening (or what there was after the US bombing of it). Thus, village life was continued in the tunnels, which were (in contrast to the combat tunnels of Cu Chi) for example, relatively comfortable. 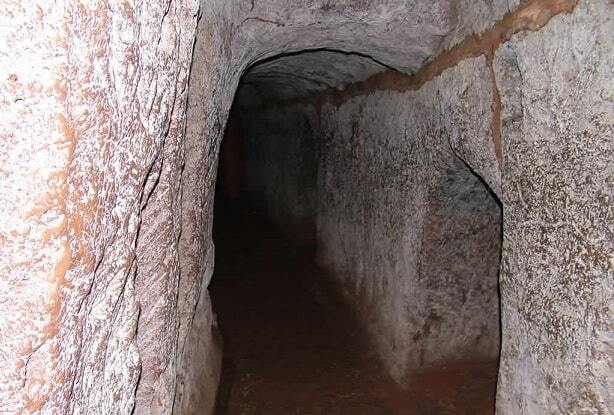 The tunnels were used not only for civilian purposes (the distinction between civilians and Vietcong is a dim area), but were also used to transport weapons and other equipment. These were brought to Con Co Island, a base off the North Vietnamese coast near Vinh Moc in the South China Sea. 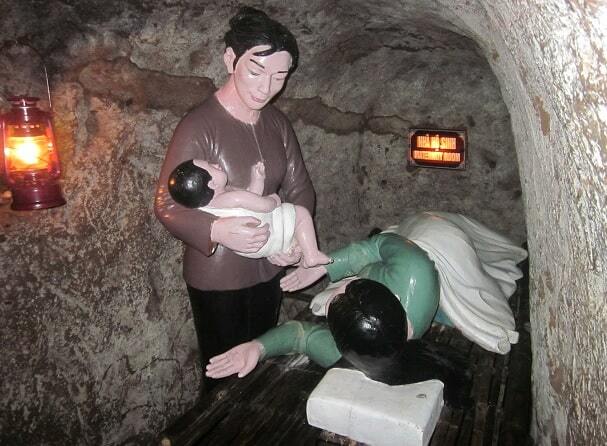 During the approximately four years they lived under the ground, there were 17 babies born in the "tunnel hospital." In principle, these babies would only see the light when the war was over. The tour usually starts at the museum, which is above the ground. There are objects and photographs on displays. There is also a watch, which is a gift from the GDR. Then begins the real visit to the tunnels. The tunnels are situated at a depth of 11 to 20 meters. You'll pass the "family quarters" - really just niches on the side of the main tunnel, with barely enough room for three people and zero privacy. They also show you larger dwellings, which were used for meetings, storage, and as a hospital. Nowadays, there are life-sized puppets, to make it clear for the tourists. Suddenly you stand again in daylight, right by the sea, just above a beach. This output is well camouflaged. This output was at night to receive weapons and other supplies, which were sent via Con Co Island. Then you go back in and finally you'll get out at one of the ground-level exits. Compared to the Cu Chi in Ho Chi Minh City, these tunnels less narrow and dirty. You have less to bend and bump your head. 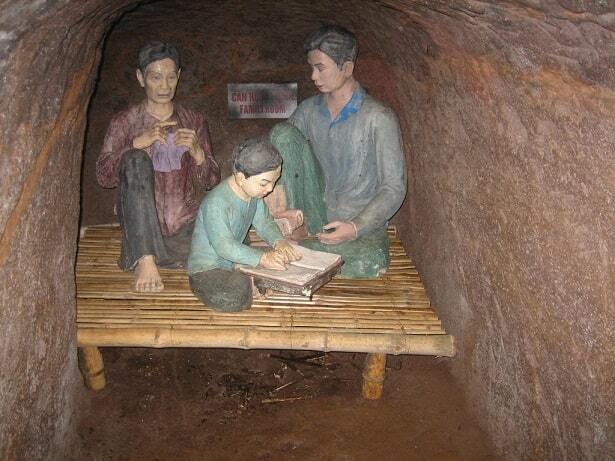 The Vinh Moc tunnels are much more illustrative of everyday life under the ground, then in Cu Chi. The tunnels at Vinh Moc apparently affected only once by a bomb. These drilled in the ground, and did not go off. It supplied the tunnel complex with a good ventilation channel. Take the exit to Vinh Moc from Highway 1. The exit is 6.5 km north of the Ben Hai River in the village of Ho Xa. Follow this road for 13km to the east (towards the South China Sea). When you are cycling coast road, you automatically come along. Tours are arranged from Hue and Dong Hoi. Vinh Moc is halfway between these places.